February program details for the Connecticut Piecemakers Quilt Guild. The one and a half day workshop begins in the afternoon. Susan Deshensky, a certified Quitworx instructor will be teaching this workshop. Susan was an avid needle pointer and cross-stitcher, when she took a quilting class and purchased her first Bernina sewing machine in October 2001. 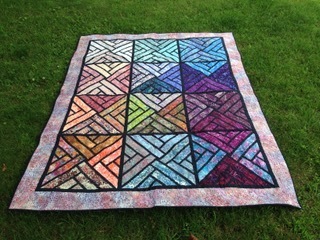 She became a Certified Quiltworx instructor in 2018 and enjoys teaching and encouraging her students to have the confidence to make beautiful quilts that they can be proud of. She also likes to work with quilt shops and guilds to make her classes and workshops a success. Susan likes to learn new techniques that expand her quilting knowledge. You will often find her traveling to classes and retreats, and meeting new people. Half day begins after the meeting on Monday (see supply list / instructions for this day).